Honey seems like a simple, comforting food, slathered on toast, spooned down to soothe sore throats, and beloved of bears, both plush and real. In reality, this sticky combination of bee spit and evaporated nectar is a powerful and ancient ingredient. For much of history, honey was humanity's main source of sweetness, as well as our first vehicle for getting drunk. Unlike table sugar, honey also comes in an infinite variety of textures and flavors, influenced by the two million blossoms from which each jar is made. And, from ancient Egypt to modern medicine, honey has been valued for its healing powers. Join us this episode as we get stuck in the sweet stuff. The honey-hunting scene in the rock shelter at Bicorp, in Valencia, Spain, via Cryptoforestry. Our ancient ancestors, perhaps stumbling across a honeycomb in a tree, likely became obsessed with their find: honey is the second sweetest substance found in nature (only dates are sweeter). According to entomologist Gene Kritsky, author of the book Tears of Re: Beekeeping in Ancient Egypt, the earliest evidence of wild honey hunting comes from a nearly 8,000-year-old cave painting in Spain (above), in which a hunter hangs precariously off a ledge in order to reach the bee's precious treasure. By about 3000 years ago, humans had figured out how to domesticate the honeybee in order to ensure a steady supply. Though Ancient Egyptians were likely the first to do so, they weren't the last, and honey grew in importance as the sweetener of choice throughout most of the world. Bees produce other products of value—their wax, for instance, has been formed into religious amulets, clean-smelling candles, and a hair pomade—but honey has served as the sweet note in recipes from ancient Egypt and Persia through medieval Europe, where monks were the primary beekeepers. Nicky and Cynthia in bee suits. Photo by Becky Masterman of the Bee Squad. Today, however, the average person consumes eight times less honey per year than medieval Europeans. So what happened? With the help of Hattie Ellis, author of the cookbook Spoonfuls of Honey, we explore the reasons behind honey's declining popularity and learn why we may want to consider reinstating it in our kitchens, for both culinary and medicinal reasons. 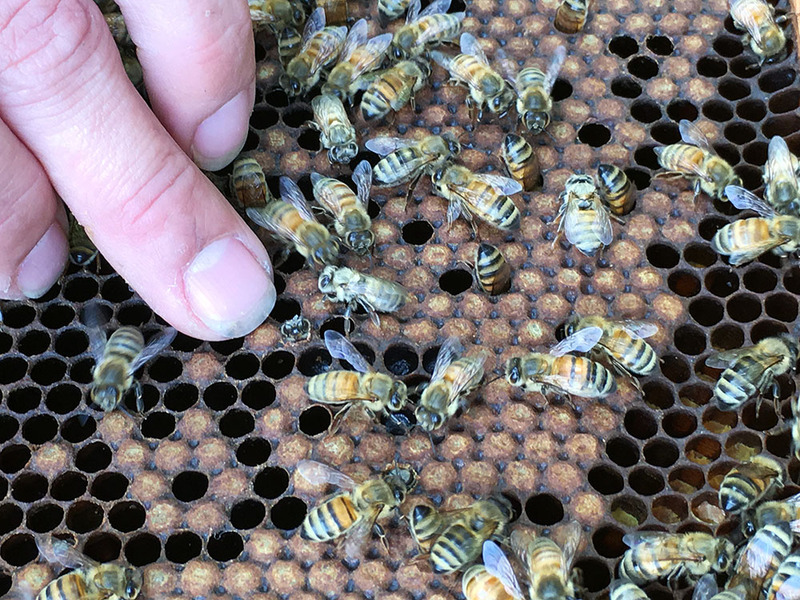 And we visit hives belonging to the University of Minnesota's Bee Lab to learn how honey is made, as well as the threats facing honeybee populations today. 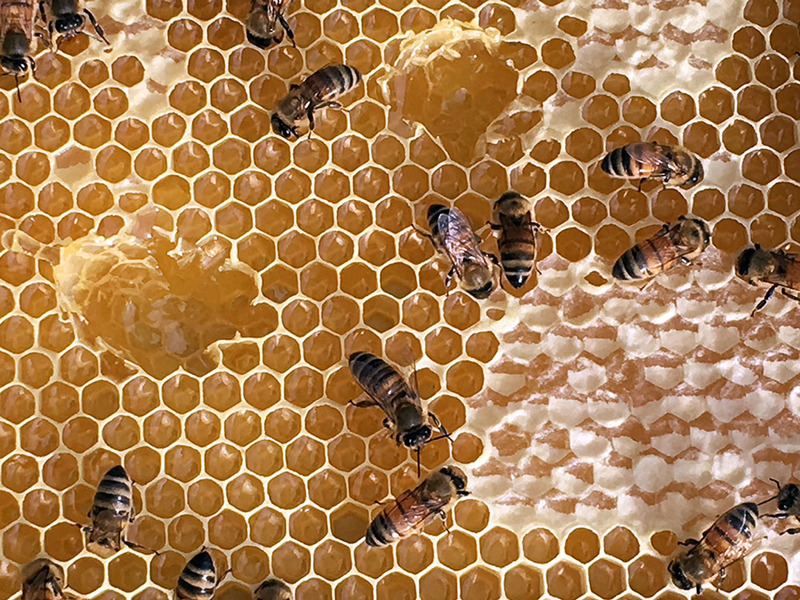 Listen now to learn about honey's many mysteries—and to hear a bee being born. Becky Masterman of the Bee Squad points to a baby bee about to emerge from its nest. Photo by Nicola Twilley. Becky Masterman shows us bees hard at work making honey. Photo by Nicola Twilley. 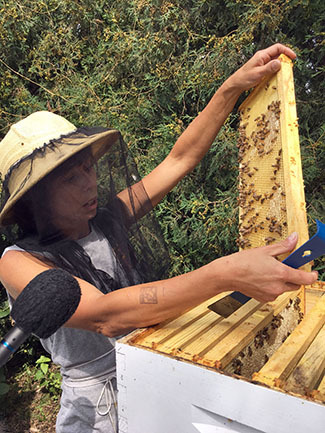 Dr. Marla Spivak runs the Bee Lab at the University of Minnesota, where her work focuses on protecting the health of bee pollinators. She founded the Bee Squad with some of the McArthur "Genius" Grant she won in 2010. 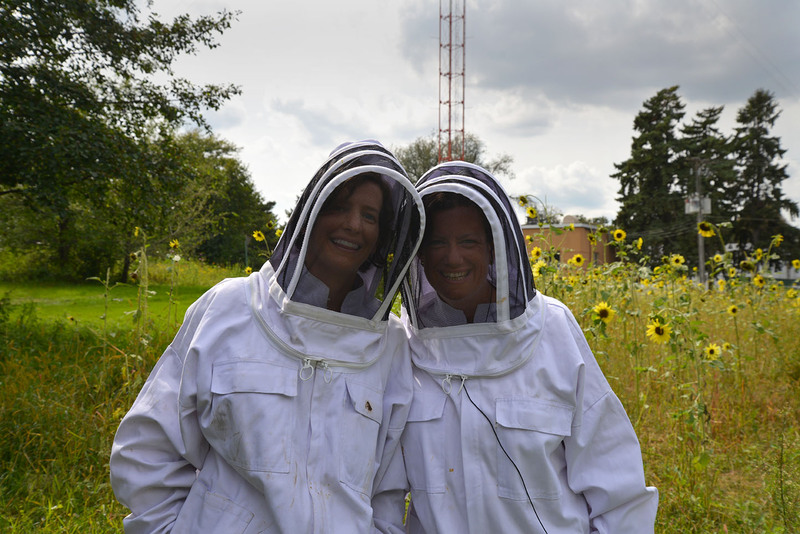 Becky Masterman leads the Squad, whose mission is to help beekeepers and the community in the Twin Cities area foster healthy bee populations and pollinator landscapes through education and hands-on mentorship. Gene Kritsky is professor and chair of biology at Mount St. Joseph University, adjunct curator at the Cincinnati Museum Center, and editor-in-chief of American Entomologist. His most recent book is Tears of Re: Beekeeping in Ancient Egypt. , among which are Spoonfuls of Honey, a cookbook that explores different kinds of honey and how to use them in the kitchen, and Sweetness and Light, a social history of the honeybee. Honeycomb with a hole where Nicky and Cynthia tasted the honey. Photo by Nicola Twilley. Bee Wilson is a repeat Gastropod guest, although we didn't speak with her for this episode. However, her book, The Hive: The Story of the Honeybee and Us, was a great resource as we researched this episode, as well as a fantastic read.